A unique ‘dining in the dark’ experience – whose guest list has seen royalty as well as stars from the worlds of stage, screen and sport enjoy their restaurants in London, Paris, New York, St Petersburg and Dubai – is coming to Scotland for the first time this Easter. The internationally renowned ‘dans le noir’ is billed as “an outrageous pop-up” that sees diners enjoy a meal in complete blackout darkness – served by blind guides. The team of award-winning chefs at the five red-star Old Course Hotel, Golf Resort & Spa in St Andrews invites guests “to see us in a different light” as they prepare to host this unique event in the home of golf between Thursday 26th March and Wednesday 6th April – plunging guests into a world of dining darkness as each enjoys the outrageous sensory and social experience. David Scott, Director of Operations at the St Andrews resort is “very excited” to be hosting the hotel’s first pop-up dining experience saying: “This promises to be a never-to-be-forgotten event for all who attend – outrageous, fun, engaging … a real ‘bucket list’ activity. We have worked hand in hand with the team from the Dans Le Noir? London and Paris restaurants. They have taught us so much. When our sight is taken away, much of what we know about how we enjoy food is lost, and we rely on completely different senses to feed us the information on the plate. It’s an incredibly exciting and valuable opportunity to showcase Scottish food and drink in a whole new light – and to have a brilliant time in the process. Dans Le Noir? is the largest permanent and private operation of disability awareness for the blind: over 40% of the company’s workforce are blind – including their waiting and ‘guide’ staff who will be leading the restaurant experience for guests at the hotel this Easter. 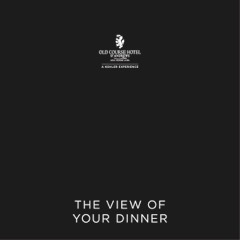 Three different Dining In The Dark Experiences are on offer beginning with a Whisky Tasting on Thursday 24 March, and Lunches and Dinners running rom Friday 25 March – Wednesday 6 April inclusive. Whisky Tastings are £35.00 per person. Lunches are from £45.00 and Dinners are from £85.00. All experiences can be booked by calling 0800 085 3275 … that’s 0800 085 DARK. Those who don’t want the experience to end can make the most of the resort’s Dining In The Dark bed and breakfast rate. A luxurious overnight stay followed by a full Scottish breakfast (with the lights on, we promise!) from £150.00 per couple. This exclusive rate is available to Dining In The Dark guests only. Food Ambassadors look to the future.